Here's Marvel's presentation, also embedded at bottom. 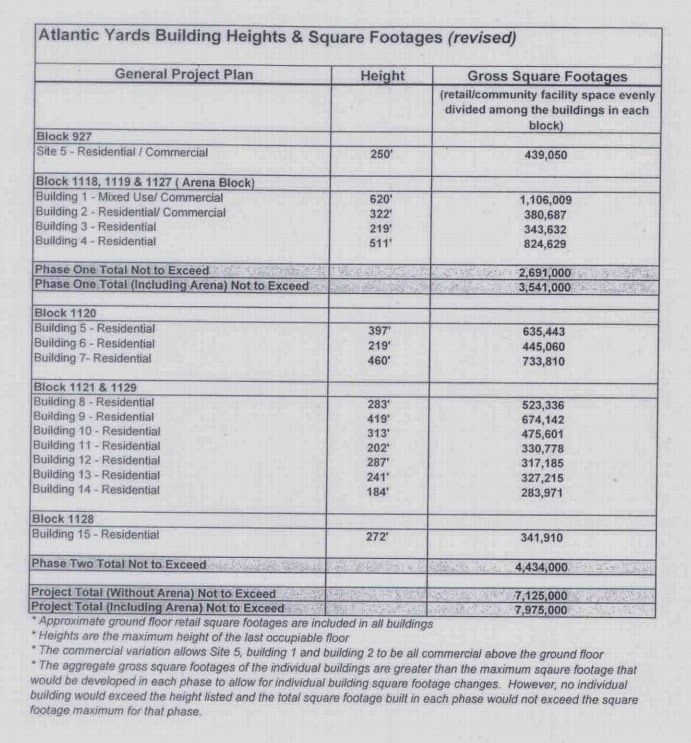 The Community Update meeting last night for Atlantic Yards/Pacific Park was supposed to include discussions of each of several building projects. But the notably contentious meeting, which included complaints about sexual harassment by workers and arenagoers, concerns about arena operational impacts, and new owners for the arena operating company, had to disband before all agenda items could be addressed. So the main event, a discussion of Marvel Architects' design for the new 664 Pacific Street tower, started only after about one hour into the two-hour meeting, which attracted some 50 people, many not previously active in Atlantic Yards/Pacific Park issues. 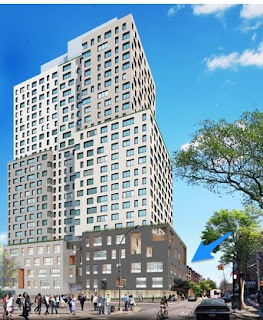 And architect Jonathan Marvel's rhapsodic descriptions of the design decisions, however impressive, were not enough to dispel concerns about the 272-foot building's dramatic discontinuity with neighbors (note the arrow I added to rendering, at right), nor the difficulty operating a luxury rental apartment building and 616-seat public school in such a tight space, with no curb cuts for deliveries or buses, across from the Barclays Center. Of course Greenland Forest City Partners, the project developer, would issue renderings that most serve their interest. 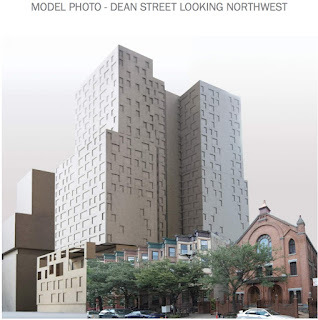 The rendering above looks northeast from Dean Street; the building, across from the arena block, is just east of Sixth Avenue, between Dean and Pacific streets, and next to four-story apartment buildings. When I asked if Marvel had created an alternate rendering showing the perspective from Dean Street to the east, he noted that they had created models of the entire project, which were shown in the slide presentation. But Forest City Ratner executive Ashley Cotton said flatly, "There's no other rendering to be released." 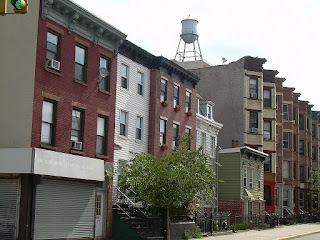 Of course five row houses, very much part of the DNA of Brooklyn, were demolished for the site. "We are between the taller buildings and the carpet of brownstone scale," he said. "We took it as significant cues to the design of building itself." That curious elision drew some gasps regarding the scale. The B15 tower, however smaller than towers on the railyards, is at 26 stories, far closer to the "taller buildings" than the "brownstone scale. The greatest challenge to Marvel is putting a school--five stories, plus two below ground--and a residential building together. The school entrance is on the "civic corridor" of Sixth Avenue, with the residential entrance on Pacific Street. School service operations will be on Dean Street, which will presumably be opposite--or very close to opposite--a fire station. On Sixth, they're increased the building setback from the required 15 feet to 23 feet, "to allow more space for queuing." That seems wise, but the lack of curb cuts or parking lanes will make things a challenge. Similarly, he said they dropped the first building setback from 98 feet down to 65 feet, aiming to bring the school "down to the neighborhood." And instead of having two building "faces" at Sixth Avenue, a carved-out center portion breaks down the scale. He suggested that the school takes cues from "very unique fenestration" nearby, including townhouses and the Church of Restoration down the block. The school has larger windows, the apartments smaller ones. "We're trying to draw a dialogue between our design and the existing context." The building doesn't have a front or back, but rather four important sides, including a "very sculptural base," and an entrance with big double glazed windows. Light colored bricks--"nine different shades of a beautiful gray," with darker tones at bottom--will characterize the building. "It's a beautiful matte texture; you're going to like this brick." Red brick, he said later in response to a question, would be too much of a sponge for water, while the light brick would reflect sunlight. Several of the people at the meeting, newbies to Atlantic Yards/Pacific Park activism, expressed concern about shadows and scale. "I understand," responded Cotton. "Everything we're talking about has been approved by public processes... The zoning's been overrode.. These are predetermined, and approved." Marvel shrugged a bit sheepishly. "That was our starting point," he said. "We were given 26-story volume... I think we've done the best we can to bring it down." He said setbacks and building textures can diminish the impact of the building. Why not stop, one man asked, at the second of three levels? "Because they can," commented Robert Puca, a longtime Atlantic Yards combatant. "That ship has sailed," added Regina Cahill, a longtime resident and president of the North Flatbush Business Improvement District. Cahill pointed out that planned open space is smaller than a basketball court and asked how many children could be out on the roof. Where will they muster in an emergency evacuation? Those questions, he said, were for the School Construction Authority. "We're meeting all of their standards," he said. "They haven't shown wisdom" in site selection, Cahill responded. "You call it a civic street. We call it a chaotic street." "You're the luckiest community, you really are," Marvel said, "because everyone else wants a school in their neighborhood." He acknowledged they had to "to squeeze and accommodate a very big [building] program on a small footprint." "I disagree with you that we're lucky to be getting a school in the form you are providing," countered longtime activist Peter Krashes, noting that the project was supposed to be finished in 2016 and the school built much earlier, with much more demand now for seats. He and others advocated for another location within the project site. How will the service entrance fit with the firehouse, he asked. The Fire Department, responded Marvel, didn't have a problem with it. "Did they have a choice?" Krashes responded. He noted that the 78th precinct now parked on sidewalks. He asked where buses would pull up. "You owe it to the community to explain how it's going to work." Cotton intervened, saying Marvel wouldn't answer questions on behalf of public agencies. Marvel did answer, though, saying that city education agencies "aren't planning how the buses are going to arrive. It's not part of the design of the layout of the school. It's going to have to happen as a management issue." "That can evolve over time, as the building gets occupied and used," he said, suggesting onlookers "take a leap of faith." Then again, the arena loading dock was supposed to operate seamlessly, with deliveries timed, and that hasn't happened. Gib Veconi, a member of Community Board 8, asked Marvel to return to make a presentation to CB 8, especially given that there was all of one day's notice for the meeting last night. Rob Underwood of Community Education Council 13, also asked for a meeting with at least CB 8 and CEC 13, ideally joined by CB 2 and CB 6, with the participation of the School Construction Authority and the Department of Education.